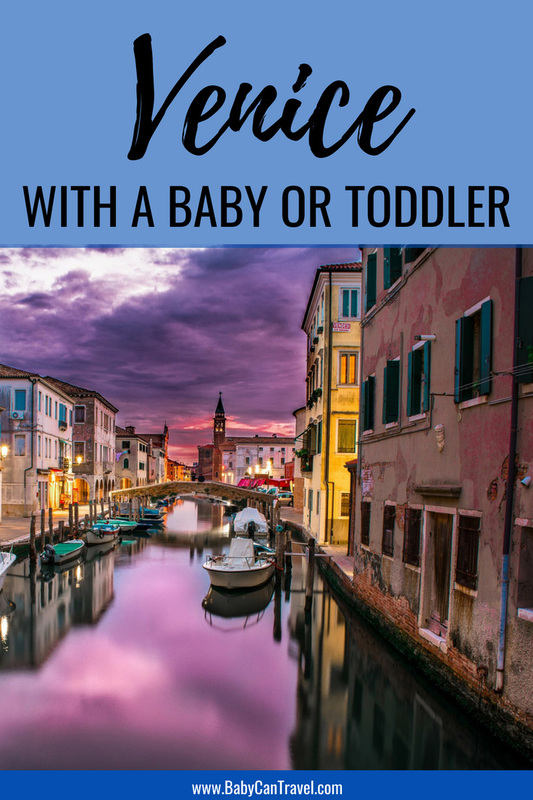 This guest post was written by Olivera of MamaRent.com where you can rent all your baby equipment for your trip in Venice, Brenta Riviera and Padua. 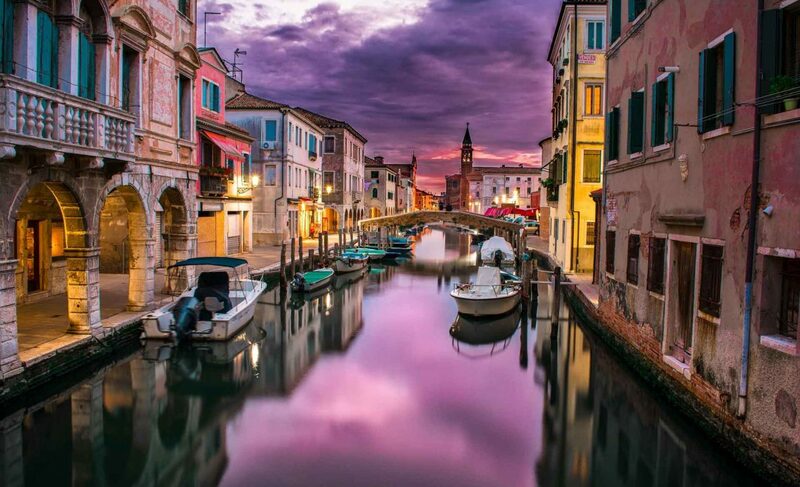 Just the mention of Venice, Italy conjures up images of a romantic gondola ride along the canals. 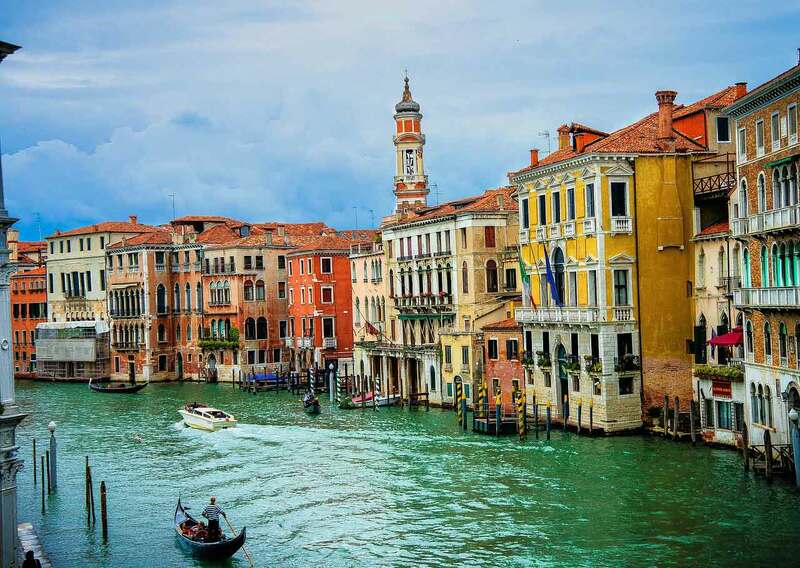 If you are travelling with a baby or toddler, a romantic gondola ride might just need to wait for a subsequent visit, but you can still make your trip to Venice incredibly memorable. If you are travelling with a baby, your biggest challenge will be traversing the many bridges and steps with your stroller. A baby carrier and a light travel stroller will be your best friends. If you are travelling with a walking toddler, exploring the car-free narrow streets will be fun, just be extra diligent watching your little one to make sure they don’t get too close to the channels or get lost in a crowd. A light travel stroller or toddler carrier will also be a must for when those little legs get tired. Visit Piazza San Marco (Saint Mark’s Square) and while you take in the incredible architecture of the Basilica San Marco, the Torre dell’ Orologio (clock tower), the Campanile, and Doge’s Palace, let your toddler chase all the pigeons. Take the #1 Vaporetto: (considered the main street in Venice). This is a highly scenic 40 minute public boat ride along the Grand Canal from Piazzale Roma to San Zaccaria. Your toddler will love being on the water. Explore the narrow streets and have your toddler search out the winged lions. Your toddler will enjoy having some time to run and if you are lucky you can find some uncrowded streets. Take some time to visit Beach Lido. A beautiful, long stretch of beach along the Adriatic Sea, a day at the beach is fun for kids of all ages. Visit the famous and iconic bridges, like the Ponte di Rialto that spans the impressive Grand Canal. Explore the many islands (post coming soon). Don’t forget the many stops for gelato! And after you’ve taken the time to see the sights around Venice, what’s next? Give your baby or toddler time to play! Garden Park Savorgnan (Parco Ca’ Savorgnan) is located in the district Canaregio, between the train station Santa Lucia and the bridge Guglie (Ponte delle Guglie). It is a park emerged into the green, very clean and well mantained. There is an area for children with slides, swings, a wooden house, a climbing gym and see-saws for the little ones, as well as a climbing structure and monkey bars for the bigger kids. There is also plenty of space for children to kick a ball around, ride a bike and enjoy the refreshing shade of the trees. It is a great place to let your toddler run aroud or let your baby practice her first steps. Don’t forget to pack a picnic as it’s the perfect spot with lots of benches in the shade and a drinking fountain. Located nearby is the Jewish Ghetto. Giardini della Biennale is very close to St. Mark’s Square, just 20 minutes walk. The playground area is for big and little kids. There is a wooden playground structure complete with wooden house, slides, swings, climbing frames, an obstacle course and many others play equipments. It is a very beautiful and peaceful park in the heart of Venice, along the shores of the Venetian Lagoon. It can been reached also by water bus (vaporetto) lines 1 and 4.1. Gardens of Sant’Elena (Giardini di Sant’Elena) is the greenest public area of Venice. It is immersed in the beautiful pine forest of the island of St. Elena where you’ll also find the football stadium. There are large areas for picnic, for playing basketball, football, volleyball and skating. There is also a very nice playground area with all playground equipment guaranteed to delight kids of all ages. You can also enjoy a spectacular view of the south lagoon. What to do on a rainy day in Venice? What to do on a raining day in Venice? Don’t worry! Venice is full of surprises and has thousands of secrets. It is the right moment to discover them while is raining outside. If your baby or toddler is great at napping on-the-go, then take in some of the spectacular museums like the Gallery of Academy (Le Gallerie dell’Academia), the Museum of the 18th Century Venice (Museo del Settecento Veneziano) or the Gallery Giorgio Franchetti. In these museums you’ll find Venetian masterpieces while you explore real Venetian palaces from the Gothic and Baroque periods. If art isn’t your thing, try the Museum of Natural History in the Fontego dei Turchi in the district Santa Croce. Is it possible to find a dinosaur skeleton in Venice!? Yes, of course: in the museum of natural history! There is an Ouranosaurus Nigeriensis, 7 meters long and 3,6 meters tall. You will also find an ancestor of the crocodile, a Saracosuchus Imperator! You’ll want to visit this one while your toddler is awake. If you’re really lucky, your baby or toddler will nap while you enjoy leisure time in one of the many cafes. 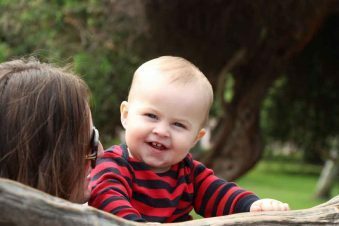 Travelling with a baby or toddler seems like travelling light would be impossible. They need a travel crib, a stroller, a high chair and so much more. What’s more, you’ll be walking so much in Venice you’ll likely want to take a break from baby wearing or have your baby sleep in the stroller while you enjoy a meal. It is possible to travel without all that baby equipment. You CAN arrive in Venice with just your baby carrier and suitcases. MamaRent has all the baby equipment you would need like a travel crib and strollers suitable for Venice for rent. The strollers are easily maneuvered by one hand and can be folded up quickly prior to boarding the water bus. These lightweight strollers are the best option as you’ll be carrying it up and down on the bridges. If your toddler is a runner and you want to give him a little freedom, consider one of these backpacks. Tip: Book a friendly local from Venice to help you through the Prontopia app. It’s a fun affordable service that can minimizes the stress of getting around the city, especially for families. It is also a great help for single parents!